As a curiosity, mention may be made in this period of I TRE VOLTI (THE THREE FACES), organized in 1965 by the producer Dino De Laurentiis to launch - in vain - the former Empress of Iran, Soraya, as a film star. The opening "number," entitled Prefazione (Preface), half-way between the alleged objective of a would-be documentary and the ironical desecration of a tabloid myth, in which Michelangelo Antonioni reconstructed the secret screen test given by De Laurentiis to the Shah's repudiated wife. The most amusing story, however, was the last, Latin Lover, directed by a young director, who died before his time, Franco Indovina (1932-1972), with elegant and restrained humor. Alberto Sordi, co-author of the script, with the faithful Sonego, dominated the screen however, reducing Soraya to the purely decorative role of "foil". In many other films where the link between the episodes is accidental, often determined by the demands of distribution (more big box-office stars) or footage (enough episodes to fill the standard hundred minutes), only the really important episode need be mentioned. In I COMPLESSI (THE COMPLEXES: 1966), Luigi Filippo D'Amico (script by Sonego) tells the amusing story of a man with enormous buckteeth who wins a contest for television announcers only because no one, in the face of his brazen self-assurance, has the courage to tell him he is not suited to television. In LE FATE (THE FAIRIES: 1966), Antonio Pietrangeli (another story by Sonego) describes in Fata Marta (Martha The Fay) a situation similar to that of Chaplin's CITY LIGHTS: this time it's a rich lady who makes love to her butler only when she is under the effects of alcohol. In I NOSTRI MARITI (OUR HUSBANDS: 1966), the episode Il marito di Attilia (Attilia's Husband) by Dino Risi (written by Age, Scarpelli and Stefano Strucchi) tells the story of the uncomfortable situation of a carabineer (Tognazzi) finds himself in on a secret mission to the suburban underworld, disguised as a streetcleaner and forced to deal with a local crook's fierce jealousy of his wife. In LE COPPIE (THE COUPLES: 1968), it is the third episode, La camera (The Room), that stands out for its acuteness and brilliance of representations; directed and interpreted by Sordi, it tells the story of an ordinary man of modest means who decides to experience at least once a rich man's holiday and goes to a luxurious hotel on the Costa Smeralda in Sardinia , where he is icily disregarded as not being "up to" either the clientele or the personnel. In LA CONTESTAZIONE GENERALE (THE GENERAL DISSENT: 1970) by Luigi Zampa, the episode Concerto a tre pifferi (Three-Fife Concerto), made in the still-heated atmosphere of student dissent which started on the Berkeley campus in the United States, then exploded in Paris in May, 1968, and from there spread to Italy), effectively portrays the awkward attempt of a respectful office worker to contradict for once the industrial tycoon whose "errand-boy" he is, all this in order not to make a bad impression on his dissenter son. The contrast between the subtly nuanced performance of Nino Manfredi and the wonderful olf-fashioned show-stealing of French actor Michel Simon is a joy to watch. In any case, at the beginning of the '70s, episode films went out of fashion, though some were produced from time to time. 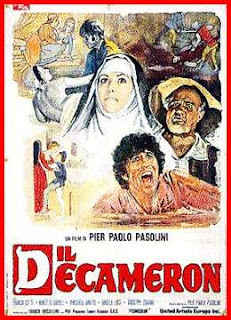 But it was precisely then that one of the most unique Italian directors (and poet, novelist, literary critic), Pier Paolo Pasolini, set the seal on the genre with three successive films in which comedy and in particular episode comedy was carried to a high level of artistic quality: IL DECAMERON (THE DECAMERON: 1971), I RACCONTI DI CANTEBURY (THE CANTERBURY TALES: 1972) and IL FIORE DELLE MILLE E UNA NOTTE (ARABIAN NIGHTS: 1974), the first derived from the book by Giovanni Boccaccio, the second from Chaucer and the third from the collection of Arabian folk tales by the same name. The best is probably IL DECAMERON, where some of the short stories by Boccaccio, literary gems of 14th century Italy, are moved from Florence to Naples and recreated in an atmosphere of exuberant vitality, set into motion by a taste for even cruel derision and incessant eroticism, and in a popular key effectively applied to the world of the Middle Ages. Episode comedy reaches its highest moment in the literary trilogy of Pasolini. Spectacle and entertainment, neither of which are lacking, provide constant glimpses of human reality, the smile, or rather the open, often "wicked" laughter of the popular jest, conceal behind the mask of merriment sudden and unexpected dramatic turns.